This is not a straight answer, but for a new user a long, descriptive answer will not work. So I will Give a list of Champs, but before I give the list I need to give you a small description, on factors that effected the selection. Answer to the question depends on following factors. There are two schools of teaching on this. Some believe that it is always good to start with a low difficult champion. This is because you are new to the game; a difficult gameplay experience would feel bad. Other school of thought explains the important to start with a difficult character and mastering him in the early ages. I have seen lot of players playing difficult characters in early stages and other players being so hard to counter him. How much you want to spend on him? To start with, you have to know most of the time high price champions have low price replacements. However, if you do not have problem with the price, high price champions always gives you a better image. Always remember price of the champion means nothing. This is the most important question. 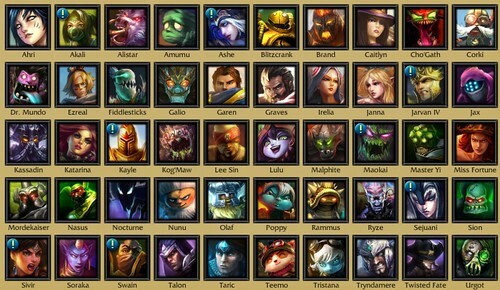 Hoping League of Legends not the first game you are playing, you might know who you are. There is an in-built character in all of us and you have to identify it. For me, I always love plying fighter, melee champions. Even though I play mage and ranged ADC champions when needed, it is not that enjoyable for me. You need you identify what you love. These champions don’t cost much, and last two are free from facebook and you tube. Always remember to try out free champs in week. These would be bit difficult and bit costly. Hope you can find a champ you can enjoy. Always remember there are no good champions or bad champions. ID DEPENDS ON HOW YOU PLAY. I completely disagree to same of these choices. Rengar for top for beginner? They must be crazy. And Thresh is also too difficult for a player to start with. 2 ADCs are good. And there are some mid laners better than master yi for beginners. Hi, thanks for the addition. On some points I can agree with you. Like Rengar and Thresh, they are difficult champions, They simply mean need a higher skill level to get the maximum potential, on the other had they are more rewarding if you master early on. And On Master Yi, he is OK for mid lane for beginners.